So, I guess I was premature when my review of Herzberg '03 included word of its imminent demise... 'cause here we are in 2004, and I have *two* Herzberg reviews to write! OK, this gets confusing; yes, Kalle Becker's Think Progressive crew did 'retire' from running the *true* Burg Herzberg event that was held last year far from the Castle Herzberg itself (but instead near Eisenach in former East Germany). But then sometime during the year a group headed by Andreas "Andi" Schnell took over the reins and indeed Herzberg will apparently continue for years to come (one can hope). But then it gets weird since Becker's crew (which may or may not have separated ties from him in the process of planning the thing, it's hard to tell rumor from fact there) still held their own festival this year near the 2003 site (it had to be moved south a few km, but nevertheless in the Thüringer Wald), which they decided to call "Herzberg goes Wilhelmsthal." Of course, this made tour-date listings (some of whom simply put "Herzberg" Festival, or some variant, for either) a mess, since the two fests were on consecutive weekends and it took some effort to tell who was playing where, and when. It would have made more sense for the HGW Fest (as I'll abbreviate it) to have been called the Cornberg festival, which really is what it was derived from, but I suppose Herzberg is a much more noteworthy name, and Cornberg had only a recent of history of being cancelled (two years in a row, running). Before next year, *somebody* has got to get this straightened out before it goes on too long. So, it was not such a big surprise that my impromptu travelling companion on the hike from the Breitenbach bus stop to the festival grounds (which turned out to be much further than I expected!) was some guy from Holland who had hitchhiked his way first to the wrong festival, and then had to do likewise to get close to the *real* site. After our hour-long backpacking trip westward toward Lingelbach (which would have been a better town to shoot for, had I known), we eventually came upon the main entrance of the grounds. This site, while still being in the vicinity of the Castle Herzberg, is not the original place (from where the castle is actually visible), so I'll call it the "Chicken City" site (via literal translation) since it is adjacent to a farm called "Hof Huhnstadt," even though it seems that maybe the place is actually a horse farm. 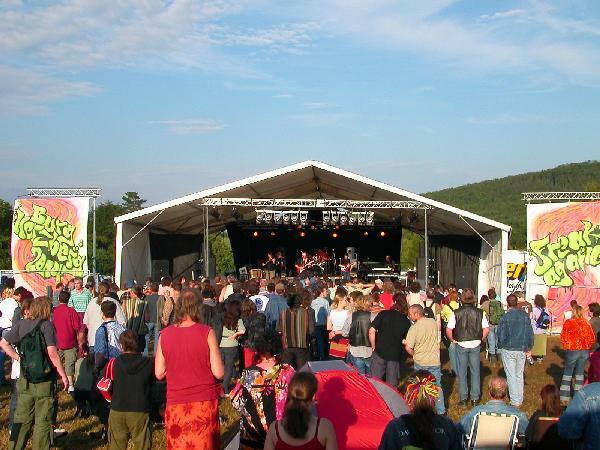 Anyway, we were quite aways outside of civilization, a perfect place to have a loud rock festival late into the night without bothering anyone trying to sleep. I had to sacrifice Thursday night's events, lest my vacation get too close to a leave of absence, so I can't tell you about the bands that played then. Both Verspielte Zeit and Nova Drive are German bands that have (from what I've just now read) a strong psychedelic/electronic flavor, so it's possible that skipping the evening could have been a mistake, but it's too late now to reconsider my travel plans! My Friday trip by train/bus covered some six hours, so with the extra hour hike, and the necessary camp set-up, I had missed a fair amount of Friday's daytime entertainment as well. The new Herzberg organizers were rather ambitious, I thought, by starting the bands as early as 11 AM, and thereby trying to fit in eight acts on both Friday and Saturday. But amazingly, they made it happen with only minor delays (almost all of which were caused by the temperamental weather). An outstanding job with stage management throughout the weekend. Anyway, Sky's Shadow were up first according to the schedule, and because they had put up a little shelter to hand out stuff and sell CDs on the main walkway between the campsites and stage area, I learned then that they played heavy progressive rock in the Dream Theater vein. Which I like just fine, but as I pointed out during my Herzberg '03 review, it's a kind of music that doesn't come across too well to me during the day, or indeed the morning! The next band, Ramses, are a name from the krautrock history books, which despite me having read fairly extensively myself, is a name that remains obscure. But from what I've since discovered, they had worked with legendary producer Conny Plank and had some ties to bands like Jane and Eloy, so perhaps I should have not allowed myself to miss them as well. But I'll still have to reserve judgement on that account until I perhaps get a chance to hear some of their old material. I should note that in addition to the three studio albums from 1976-81, the recent reunion produced a studio album ('Control Me') in 2000. Presumably, the Mark Gillespie Band played next, fronted by an American guitarist/vocalist but still a German-based band. Their website tells little about their style, but I will guess that they are in the blues-rock vein, especially since they opened for Jethro Tull some years ago. Now we come to a band I actually heard! Well, ok, only from a distance. While I was finishing up my campsite preparations and tracking down some old acquaintances, I could hear some familiar music drifting up from the stage down the hill. Which were old Hendrix tunes, played by Randy Hansen and Co., another German-based crew with a presumably-American frontman. As much as I like Hendrix, that 'tribute' thing has been taken way too far IMHO (why didn't it die out like the 'unplugged' fad? ), and so I hung out some more in the nice Café on Main Street. That continued through Trigon's performance, who were one of only two bands that were brought back from last year. Again, I remained in the Café sipping rum punch as this brand of heavy instrumental prog-rock just doesn't sit right with me for such a (sunny) atmosphere, for some reason. But now a visit to their webpage shows me that they are offering for free download a sampler of their music... which is pretty cool. (Note that they don't mind accepting a donation.) And also one can order a CD copy of their performance here at Herzberg '04 (or indeed the ones from '02 and '03 as well!) for 10 Euro. It's nice to be fan-friendly in this neo-golden age. As darkness was approaching, I made sure to head down to the stage as Birth Control was due up, a band that I'd seen already twice in the past two years, and I know would be worth the effort. Well, OK, perhaps in the annals of Krautrock, they are more 'rock' than 'kraut,' but nevertheless they play a brand of classic rock with some strong progressive touches at times. Drummer/vocalist Bernd "Nossi" Noske is the main man these days, being the only one from the original crew still around. The others, Peter Engelhardt (Guitar), Hannes Vesper (Bass), and Sascha "Sosho" Kühn (Keyboards), all date since 1995. But since it's Noske's voice that I like best about Birth Control, I can still think of their current gigs as 'authentic' in some way. They perform a roughly equal mix of classic tunes and newer stuff. 'Alsatian' is the newest CD, and one song I remember that they played from it had a much more straight-blues feel. The older stuff was given a new flavor occasionally, "The Work is Done" (from 'Operation') having a brief dub-section thrown in, and "Trial Trip" (from 'Plastic People') featuring an impressive extended guitar jam by Engelhardt. And of course, their classic songs like "Back from Hell" and "Gamma Ray" were prominently featured, the latter going on some 20 minutes I'd guess, including solos from everybody. Like I said, Nossi's voice is unique, with that peculiar resonating tone that I've only heard from actor Christopher Walken (listen to the half-spoken intro to "Gamma Ray" and tell me he doesn't sound like a German Walken!). A pretty strong contingent of folks had gathered in front of the stage by set's end, and brought them back for an encore, which I think was "I Sent My Mind On Vacation" from 1996's 'Jungle Life.' Which was a nice sentiment to wrap up a strong performance. Now we were closing in on 11 PM Friday night, and so it was time for the headlining act to appear. Which, much to my surprise and appreciation, was Mr. Quimby's Beard. I mean, it's my opinion that a space-rock band of this quality should deserve such a recognition, but I'm aware that not everybody would think likewise. So it was my thought that perhaps the slot was opened for MQB because space-rock is so closely associated with psychedelic lightshows, and it's hard to have such a lightshow before dark! But then, as MQB went on, I noticed that no such lightshow was even put into place, so I must conclude that the organizers just really think like I do, and see MQB as a headlining quality band based entirely on their music. Well, great then! And so off we went into deep space, with the Quimby's putting on quite a strong 85-minute set, featuring both older tunes and some brand new stuff (one song even without a title). While that might be a risky thing to try, it certainly is appreciated by those of us who are long-time fans, to see what's coming down the road. They were also getting used to being now just a four-piece, as the band has now parted company with the Walton brothers, Jim on guitar and Chris on drums. In the process, their old drummer Gaz (who played on all the studio albums, in fact) has returned to the fold. And without missing a beat. In fact, he was quite impressive, playing with both power and precision throughout the set. But anyway, going into the weekend, I was curious to see how the music might be different with just Ray playing all the guitar parts. But, to be honest, throughout the gig I never made a single mental note (nor one on paper) about the single-guitarist situation. So, as I forgot totally about it, I guess it really didn't affect the music so much after all! Let's see... I was certain I could do a faithful review without jotting down the setlist, but now it's longer into the future than I had expected at the time. And so I find my memory is lacking some amount of detail. The band has been working for what seems to be an eternity on the long-awaited new album (which now is being redone once again due to the lineup change), but two songs "Pollen" and "Chariots" have been in the set for several years now. The latter, coming somewhere in the middle of the performance, has become I think my very favorite Quimby tune of all, and so it really got things going. In fact, I can recall running around in circles amidst the seated fans (just behind the dense crowd down front) almost giddily, forgetting for the moment all the world's problems. The crowd had grown to several thousand I imagine, and must have been an experience to remember for the band as well as us on the field. Along with "Chariots" (and "Nebulae" near the beginning... I think), one of the top highlights was the encore, which I expected to be "Marijuana Nightmare" since Ray had been playing the chord during the soundcheck, but then synth-guru Hardy announced the longer, more dreamy "Beyond the Light." Excellent choice, and a strong finish to a transcendent experience on par with their memorable headlining show at the final Strange Daze festival in Ohio. Here, the limited visuals were less than ideal for a space rock performance, but that was more than made up for by the vast number of people enjoying the music pumped out at high volume and bouncing off the distant hills. Late night entertainment on Friday night was also not so shabby, as we had Guru Guru on the schedule. The working plan had only been set back a half-hour over the entire long day, so at 1:30 AM when Mani Neumeier and Co. went on, we still had a fair crowd established. As much as I am a fan of the full musical career of Guru Guru, their live set is starting to have too much predictibility in it, now that I've seen them on four previous occasions. That probably wasn't true for many people in the crowd there, I know, so presumably it didn't bother them. But I think it's time for them to consider some new and/or different songs, preferably pulling out some more things from the past. At the fest, I picked up the new "Psychedelic Monsterjam" CD, recorded by the trio of Neumeier, old Guru guitarist Ax Genrich, and bassist Dave Schmidt, over two live sessions in Würzburg. On that slab of plastic, one can find a really nice version of "Electric Junk" from the 'Hinten' album. So I would suggest that something like this be brought into the Guru Guru setlist, as I know Luigi Archetti could do something interesting with the guitar part there. OK, maybe he'd rather not be put into the position of 'mimicking' someone else's guitar work, but in any case, something new needs to be put into the set. Right now, they're just mixing around the order of the same 90s-era tracks, some of which are pretty featureless rock numbers like "Jet Lag" and "Moshi Moshi." The more 'world-music' stuff, like "Tribes and Vibes" and "Marabut," still are strong points, especially since Archetti can do some really creative things on the spot, like the crazy delay-guitar solo he offered on the latter track. And the "Ooga Booga" (from 1972's 'Känguru') finale was definitely a highlight, but this (along with the "Der Elektrolurch" jam, which in truth only includes one part of the whole song) has been their finale/encore combination throughout their last two years of touring. Well, I know that these guys have other projects that they keep busy with, but since the core Guru Guru band is the most widely recognized entity of their family tree, it would be nice to consider some more new stuff. The one brand new song they have ("G.G. Top") is a start, but I think a much larger overhaul is in order now. I hate to sound too critical simply based on my over-familiarity, but I have to stay truthful to my own perceptions. All in all, though, a great Friday night of entertainment that kept me going until 3 AM without any problem. Oh, and the guy who came out and did some fire tricks during the last number or two was pretty cool. Saturday started at quarter-past-11 AM, so hardly time for one to do much else but rise up and make the long walk down the hill to the stage. I had brought along a few sci-fi books to read in the mornings and between bands, but I didn't get through much of them until after the fest was over. Like last year, I had brought along a Clifford Simak book to read, not just because he's one of my favorite authors, but because his brand of sci-fi is so attuned to such a rural setting, often with characters out of the deep woods integrated into the story, and often the trees and wild animals (and always dogs) as well. Anyway, I got through hardly a chapter or two before Farfarello hit the stage, with a guest named Nippy Noya along for the ride on various types of hand percussion. The 'star' of Farfarello is violinist (and flutist) Mani Neumann, who is quite the dynamic performer. And so this ensemble immediately reminded me of the San Francisco band Azigza, especially since their jazzy-folksy-worldly brand of music was not altogether dissimilar. At some point during the set, one of the players did an extended acoustic guitar solo bit. But mostly the music was upbeat, instrumental stuff that was just the right prescription to start off the transition from morning silence to afternoon thunder. Berlin's Karthago, another old classic German rock band, came to play next, fronted by guitarist/vocalist Joey Albrecht, but also featuring keyboardist Ingo Bischof, who put in duty with both Kraan and Guru Guru in his years following his original membership in Karthago. Somewhere in my CD collection back home in the US I have their 1974 'Rock and Roll Testament' album, and from this one I remember they played "Now the Irony Keeps Me Company." Here, we saw Bischof adding in some nice synth textures as an intro, whereas more often he was engaged in fluid runs on electric piano. Normally, Karthago's music is a rather funky-blues rock with Albrecht's gritty voice giving the music a stronger bite. A song from their first S/T album (trivia: which was the basis for the cover art to the Freeman Bros' popular Krautrock guide "The Crack in the Cosmic Egg") entitled "String Rambler" was maybe the highest point for those lovers of long blues-guitar jamming. "In the Midnight" showed off the funkier but-yet-dirtier side of the blues. Now things were starting to build towards something more frightening! And then it came... the first rainstorm. I wasn't in the mood for getting wet, nor hiding in small shelters or a crowded beer tent (just yet), so because I could see it coming in advance, I was able to head back to the refuge of my tent to wait it out. In the end, I ended up dozing off for awhile and woke up to calm skies, so I got myself back on my feet and made my way back to the viewing area nicely refreshed (and still dry). The alleyway was now on its way to becoming Schlammstraße, but the organizers, thinking ahead, had already laid the ground around the most heavily tracked areas with wood chips. So no great problem. I got back to the stage to catch the last two tracks by the Hattler Band, featuring bass legend Helmut Hattler of Kraan. I've been quite a big fan of Kraan's music for some years now, and expect any day to finally catch them in concert (there's a Krautrock festival with them planned in October, so maybe then). But just to hear him play bass live for 15 minutes was a treat. The style of his solo work is not really my thing to be honest, lots of modern pop flavor added over top of his intricate jazzy bass lines. The two female singers, Sandie Wollasch and Nkechi Mbakwe, had nice voices and enjoyed performing, but the overall sound seemed to be a bit out of place at a so-called 'freak hippie' festival. Well, I didn't hear their entire set so I won't be too judgemental, but I am definitely interested to see Hattler again with Kraan. I wish the whole band had come, and especially if they'd have drafted Neumeier, Bischof, Ulbrich, et al. and done an "All-star Krautrock Jam." So now as we hit mid-afternoon, New York's Frogg Cafe came onstage. I had seen some of their merchandise on the official Herzberg table since Friday, so I was intrigued by what they might be like. Well, their album art is quite a bit more psychedelic than their music, but then their music was still quite good. I might say that they were a kind of Canterbury-prog/jam band, like Caravan meets Phish. At times, they also would throw in Zappa-like tangential excursions. Of the five, one guy played mainly violin and vocalist Nick Lieto occasionally played trumpet. I won't bore you again with my reasoning, but as I don't like trumpet in rock music, this aspect I could have done without. After awhile, I started to feel like they were too much like an indistinguishable summarization of everything that had already been done before in 30 years of "prog rock" music, but then I found myself getting into their stuff a lot more towards the end. This included a slow "swinging" piece that while simple, was also quite elegant (theme music for circus acrobats, it sounded like), and then a strange rendition of the 2001 theme ("Thus Spake Zarathustra") which surprisingly worked. So they kinda grew on me, but not quite enough to buy a CD, though I really liked the album art. I'll remember the name though. So, yes, Sweden's Anekdoten got things rolling very quickly again at 9:15, though it took yet a few more minutes before they could start actually playing a song, because Anna Sofi Dahlberg was getting absolutely nothing out of her Mellotron. Well, I guess it was just a faulty connection/patch cord, 'cause they got it straightened away quickly enough. With that, they launched straight into their set without so much as a 'note' for a soundcheck. (Maybe they knew what was coming?) Anyway, I had just seen them live back in April '04, so I knew what to expect. It was now nearly dark, so I wasn't so bothered by their decidedly non-hippie music (as I was just ranting about above), but still their melancholy style is a little odd for an outdoor 'festival' atmosphere. (It would have been really cool though alongside a foggy lakeside at dusk.) I think their new album 'Gravity' is not only their strongest work, but also one of my favorite albums of the new millennium. The first two tracks ("Monolith" and "Ricochet") came right away near the start, and got the ball rolling big time. At times, they dipped back into the past for some of their more complicated and 'angular' works (which tend toward the style of King Crimson), like "The Old Man and the Sea," and the title track from 'Nucleus' (which I like 'cause it's in 5/8 time, and I like anything in five-time... more jolly even than seven-time IMHO). But more of the material was from the newer two albums, which are far more 'linear' and atmospheric, while still retaining a certain heaviness. Which is why I like them so much. I imagine that the Hawkwind fans that were gathering in numbers by this point were also finding Anekdoten to be highly worthy of their attention. And indeed, *I* was so much at attention that I had no clue as to what was about to happen. This was about at the one-hour point of their set, when suddenly I felt from behind me a rather stiff breeze, whereas it had been completely calm up to that point. When I looked up to the sky, however, it was *extremely* odd. Everything to the east was dark grey (the sun had gone, so it was the normal sky color with some high clouds), but behind a perfectly linear boundary across the sky, everything was absolutely flat black in the western sky. Eerie. When I turned all the way around, I could already see that the far side of the open field was getting more wind bursts. And it wasn't even 30 seconds later before all hell broke loose, and everybody was streaking off in opposite directions like cockroaches in the kitchen when the light comes on. Going back to my own tent was completely out of the question, since the rain came down in sheets almost instantaneously, so I sprinted straight into the large beer tent, which not surprisingly was the destination of another 500 people or so it seemed. It was some 30 or 40 minutes before the storm calmed down enough to venture out, but then the steady rain continued for at least another two hours. Well, ok, it appeared obvious that they weren't going to hold up the stage change-over to allow Anekdoten their last few songs. Which was unfortunate, but I fully expected them to prepare for Hawkwind and be ready when the storm subsided to keep everything to a reasonable timeframe. It was the right choice. In any case, Nicklas Barker (I think it was) earned the "Quote of the Festival" award when I heard him suddenly stop singing and say (as I was already running away) "I guess God wanted us to stop." So now, with the rain still falling rather steadily, the stage team couldn't wait any longer, and Hawkwind took the stage around midnight. The Hawks were back to their core unit of Dave Brock, Alan Davey, and Richard Chadwick, which meant that keyboard parts would be more automated than those times when Tim Blake, or Keith Kniveton, or Simon House are around. So perhaps these shows are a bit less conducive to experimentation, but I'm not so sure that's true. Over the last decade, most of the Hawkwind shows I've seen, no matter the number of performers on stage, are always pretty well arranged in advance. Which doesn't bother me so much as Brock has always been able to construct new and interesting ways to perform the "same music." The one exception is the arrangement of "Assassins of Allah/Space is Their (Palestine)" that they've been doing in similar fashion for a good decade. So the show got off to a blazing start, as just after a moment of synth introduction, they launched into "Assault and Battery," followed up (as it should be) by "The Golden Void." The ending of this gem pairing has in recent days been segued into the "Where are they now?" song that only Hawkwind completists are likely to know. But it's an effective reworking and they should keep doing it this way for awhile at least. I had nestled up close to the stage on the right side, where someone had fixed a large umbrella to the security fence, and so I had both a good view of the stage and could hear the music loud and clear (the PA was hanging just above me in fact). The ground beneath was a bit of a quagmire, but at this point, lots of people stopped caring and just dealt with it. After a bit of new ambient material (under the title "Out Here We Are" and intended for the new album 'Take Me To Your Leader'), they went back to rocking mode with Bob Calvert's "The Right Stuff" (which you can hear Monster Magnet playing these days as well), and then the ubiquitous "Brainstorm." All was going great, and the crowd (fully ignoring the mud) was loving it. But as the last gasp of the storm was raining down, technical problems reared their ugly head. During "Angels of Death" and then just minutes later in the middle of "Psychedelic Warlords," a crazy sonic attack commenced, which made Brock's guitar (and perhaps Davey's bass as well) start cracking up. I thought it was something wrong in Brock's own amplifier, but perhaps it was due to the rainwater getting into the wiring of the PA system, which was indeed quite openly exposed to the falling rain. It was disappointing that the choppy 'Six Million Dollar Man' effects half-ruined the classic "Psychedelic Warlords" track, but thankfully the problem was relatively short-lived. (Oh, and I wish they would do the PW chorus in the original 'Mountain Grill' way, instead of that drab singing style that Huw Lloyd-Langton first started using, if I remember correctly). Anyway... all was again sweet and clear when Davey cranked out the glorious "Watcher" riff, which is usually his high point of the show, Lemmy protégé that he is. But it was "Spirit of the Age" that was on this night the true highlight event. At times in the past, I've thought that this song was rather over-rated due to its simplicity in form, but there's yet a great deal of beauty in the piece when done right. And here, Brock was in an unusually playful mood, coming out from behind his phalanx of synth gear to offer up a pair of soaring guitar leads. The end came all too soon though, as following the "Assassins of Allah" finale, we only got the punchy but brief "Brainbox Pollution" as an encore. All in all, it was a satisfying set of well-performed material, especially having persevered through the heavenly hazards that night, though I wouldn't say that the band were in their highest form either. But I sometimes expect a little too much from these legendary Masters of the Universe. Being a three-piece may indeed limit the band in terms of on-the-spot manueverability, but in the end I thought they were somewhat more spontaneous than usual. Perhaps the festival atmosphere is something that brings out something a little special in all three of them, and without a Hawkfest '04 happening (sadly), this was only one of very few such occasions for them this year. The Saturday night festivities were not quite over though. Somewhere in the vicinity of 2 AM, the stage came to life once more in the form of a seriously heavy psychedelic trio with the not-so-inappropriate name Pothead. The core of the band, guitarist/vocalist "Brad" und bassist "Jeff Dope," hail from Seattle, Washington, but roughly 10 years ago had moved to Berlin, which proved to provide many more opportunities to play out live without so much travelling. Soon they had met up with local drummer Sebastien and the trio was complete. This I know now, but I had no clue as to who these guys were at the beginning. But they very quickly won me over. It was hard, heavy, psychedelic, and I couldn't force myself to leave, even when I started to really zonk out from exhaustion from such a long day. I suppose one would not hesitate to throw the label 'stoner rock' on Pothead, but I'm not so sure it fits so well. Having been in Germany for so long, it doesn't seem they would have so much in common with the many 'stoner' bands in the US and UK, so perhaps ColourHaze in Munich is their lone contemporary. And indeed, to my ears, what they were doing was better than quintessential stoner rock, though I'm not really sure what it was that was so different. The songs just had a tremendous power to them, not just in drive or noise level, but the riffs were just really well-constructed. And they built momentum steadily through the performance, which lasted well into the night. I don't remember song titles so well, but the final song, which just about blew my mind, I think was called "Black War." At least that title seemed familiar as I just scanned through their online discography at www.pothead.de. I see that they've made quite a few CDs in the last decade, many of which are still available from them directly, so I think I'll have to put in an order soon. I definitely want to hear some more Pothead. I did finally head out towards my campsite just as Pothead came back for a few more songs as encore. But it wasn't necessary to hang around down by the stage to hear them, as at this point in the still night, they could easily be heard from the very top of the hill far in the distance where my tent lay. When I arrived, all finally went silent and I very happily and quickly crashed into unconsciousness. Sunday morning came all too soon, of course, but thankfully I was not going to be on the move until the next day and could just hang out and take it easy. The entertainment again started early, though there was some delay in getting the stage going and so it was a bit past 11:30 when Russia's Ole Lukkoye took to the stage. 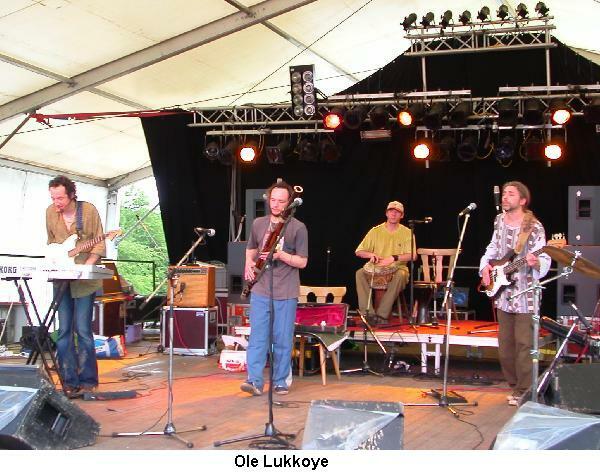 If the band's name doesn't seem exactly "Russian-like," well that's because it comes from a classic story by Danish author Hans Christian Andersen, in which Ole Lukkoye is a dwarf who visits children at night in their dreams. On this day they were a four-piece, but I think they have various guests on their albums and have had a female vocalist at times. 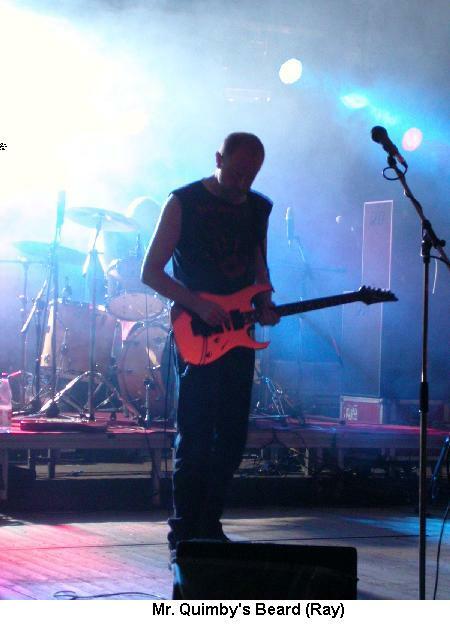 Boris Bardash is the band's founder/leader, and plays both keyboards and guitar, as well as doing vocals himself, usually of the 'chanting' variety. Often, he had his guitar plugged into his synth directly, and so was using the guitar as a trigger for certain sounds and effects. Their set was unfortunately a bit short due to the delayed start, but they got about 65 minutes of music in, which I would describe as simultaneously "organick" and "trancey." In contrast to Bardash's modern techniques, Ole Lukkoye also featured hand percussion (tablas?) and a bassoonist, who goes by the single name Frol. In addition, they mixed in synthetic bass rhythms in addition to the real bass guitar, and also piped in female "space whisper" vocals in lieu of a real person. Whatever that description sounds like to you, it worked very nicely. I don't have their last two CDs, which must have been the source of most everything they played, since I didn't recognize any of the songs. The crowd was amazingly large though, considering the time of day, with well over a thousand coming down early and obviously enjoying themselves. The sound was particularly clear and punchy and so many were unable to keep still, and so the lawn/mudfield in front of the stage became an ersatz dancefloor. Great to finally see this band for myself after having enjoyed their first few CDs for some number of years now. The next band was advertized as Jahcoustix and Dubios Neighbourhood, which pretty easily gave away that we were in for a bit of reggae, as one might expect on such a festival Sunday. Oddly, though, as the main part of the stage was undergoing the necessary renovation, a couple other guys jumped onto the very front of the stage with some sort of hip-hop mixing/scratching desk and a microphone and played three songs as extra entertainment. I have no idea who the heck they were, but they were on and off so quickly that they didn't affect the time schedule much at all. Two of the songs were this hybrid urban-dub music that, while based upon traditional reggae, has been fatally (IMHO) usurped by the hiphop culture that is now ubiquitous throughout the far western hemisphere. Strangely, the middle song was just the one guy singing and playing an acoustic guitar. I took a photo just for the record (well, to be truthful, I thought at first they *were* Jahcoustix et al. ), so if and when you peruse the photo gallery, you know why this is included and what that was all about. Anyway, within just a short time of them strolling off, the *real* Jahcoustix and crew came to the stage, but they themselves are a mixture of two different entities (hence the two names) I think, both based out of Munich. I guess that's why they didn't all come out at once. Jahcoustix is the stage name of the dreadlocked one who came out last and from then on did the majority of singing, as well as playing guitar, I think. Together with Dubios Neighbourhood they made up quite a nice traditional-style reggae band, with the all-important bass guitarist in tow, along with organ, hand percussion, and a drumkit. They got through about 70 minutes of music, which likewise was well-received and got legs and limbs loosened up even further. I chose to lay peacefully in the shade of a well-placed umbrella next to the nearest makeshift cafe and soak it all up in a less-exhaustive fashion. I've always liked reggae music, though I hardly have the sophistication to know one band from the other, or much care. These guys played good reggae, and didn't bastardize it with that other nonsense, so that satisfied me completely. I (and I) was (were) happy. Somewhere in the neighborhood of 3:30 PM (I don't know for sure... I seem to have lost my last page of notes), Dissidenten appeared. Sounds like a punk band, doesn't it? But this was not at all the case. The first few things they played were really quite astoundingly good, I remember, but it seemed that as they went on, they drifted gradually into other territories that didn't hold for me quite the same appeal. They were definitely quite eclectic, touching at times on the same sort of tribal psychedelia as Ole Lukkoye, but yet different. I remember that the drummer was really very good, and always playing intricate fills (I'm thinking of either Porcupine Tree drummer) without ever intruding too much into or over the less-than-heavily-amplified lyrical instruments and voices. I've tried just now to figure out a bit about the Dissidenten history at their online site, but all I can tell is that they started in Berlin many years ago, and have been very nomadic since, and therefore have had what seems to be a very nonstationary lineup around the three core members. Of the pair of vocalists, it seems that the female seated out front was perhaps Bajka Müllrich (daughter of one of the three), though the male seated crosslegged in back I can't even try to identify, though he obviously is of Indian descent. Near the end, I ended up crawling back up hill to exchange some things in my tent and meet up with some folks, but the Dissidenten definitely intrigued me and I will remember their name in the future, hoping again to hear some more of that really excellent stuff at the beginning of their set. Panteón Rococó was next, a "big band" from Mexico playing hyper-kinetic ska-like music, and that proved to be very popular for those inclined to dance. Now we are getting quite far from my sort of thing, so I won't try to do my usual pigeon-holing analysis. Fact is, once five guys with horns show up on stage, I'm out of my element completely. Coming from a horn player myself, I know that sounds strange, but then why must one enjoy hearing the same things as they enjoy playing necessarily? Anyway, they cranked through a sizeable set of upbeat and energetic music that was by no means inappropriate for such a fest, given the huge number of acts that had come ahead of them. I mean, there *has* to be enough variety to keep things interesting for the variety of tastes of the many audience members, right? So then the final musical participant, known as 17 Hippies, took the "big band" one step further. Though on this day, they were short four hippies as my companions and I were only ever able to count a maximum of 13 during any one song. I wasn't sure what we were in for, but I did know that a musician that I respect and admire was one of the 17 (or rather, 13). I'm talking about Lutz "Lüül" Ulbrich, who you might recognize as one of the primary guitarists of Agitation Free, as well as latter-day Ashra (formerly Ash Ra Tempel). Furthermore, Velvet Underground fans should know that he also collaborated musically with his long-time girlfriend Nico until her unfortunate demise. Well, ok, 17 Hippies has little in common with these legendary psychedelic bands. Instead, it is a kind of one-stop world tour of traditional folk music, where Ulbrich contributes almost exclusively on banjo (occasional acoustic guitar). Again, there were horns of all shapes and sizes on stage up to and including tuba, and a myriad of other strummable instruments. And what would this sort of "drinking" music (and that's the kind of folk music I'm talking about) be without the accordion? Or two. I think they had two actually, though I believe one was really a concertina, as we were debating at our table near the "bar." So, I would have been happier to have seen Ulbrich show up with Manuel Göttsching or Michael Hoenig to perform, but still it was interesting to see how diverse such an individual can be. And he really loves performing such music, it was clear to see. One thing though... it must not be so profitable to play such gigs. I mean, really, if you have to split the money (up to) 17 ways, that can't leave so much to feed one's family (not to mention all the strings and accessories needed for their many instruments!). They must *really* just love to play. The night was early yet, with the program set to run only until 9 PM or so, such that those who lived not so far away could still head home that night. My fellow Hawkwind fans and I were all long-distance travellers, so we were to stay put for one more night. Even with just some rain-soaked wood to work with, we managed with great effort to start up a respectable campfire (one of many, which helped a great deal for late-night navigation), and just whiled away the hours looking up at the stars. Which was interesting, since one forward-thinking traveller had brought along an astronomical timetable and we could search for overflights of the ISS and various satellites whose orbit-correcting flares are bright enough to be seen easily from the surface.